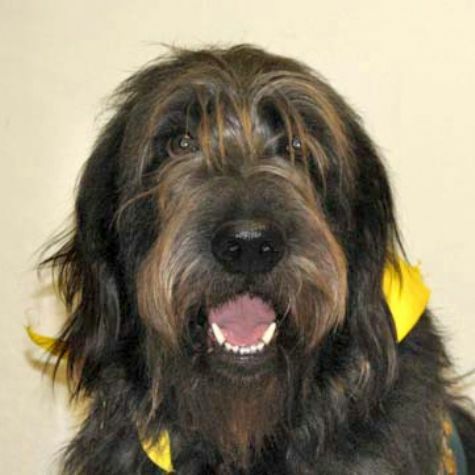 Neo is Labradoodle who weighs about 100lbs. His dad is a black Standard Poodle and his mom is a chocolate Labrador Retriever. Labradoodles don't shed, so they are great for therapy work. Neo is a really sweet dog who LOVES children. When he sees kids, his tail starts wagging and his ears perk up. At home, Neo enjoys chasing frisbees and swimming in the pool. He's so tall that he can stand up in the shallow end. When it's hot, Neo will swim 4 or 5 times a day. Neo loves his job with LO4P.